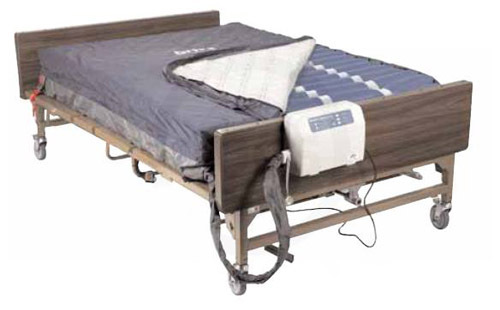 Static perimeter tubing surrounds the length of the mattress preventing the patient from becoming trapped between the mattress and rails and increases patient safety during transfers. Pump can be used in a static or altering pressure mode. Ideal for use in nursing homes hospitals and home use. Perfect for the prevention and treatment of decubitis ulcers. LED and Audible alarm activates when mattress pressure falls below 10 mmHg. Cell within a cell design prevents the patient from bottoming out in the event of power failure. High volume extra quiet pump produces 8 LPM. Mattress has 20 air bladders 9 with laser cut low air loss increase patient comfort: helps keep the patient cool and speeds recovery. Low air loss helps keep patient cool and comfortable increasing healing rates. 8 cells are constructed with Nylon/TPU that is soft lightweight and will not stretch. The zippered Nylon/TPU cover material is heavy weight water resistant vapor permeable has a fiber quilted bottom and is machine washable to provide protection and comfort. Specially designed 3 tube pump and pad system quietly operates low air loss system while maintaining perimeter. Spring lined tubing prevents kinks and helps maintain airflow. Quick fill adapter standard. CPR valves for fast (20 second) air release. 450 lb. Weight Capacity. Pump can be used as static or alternating pressure device. Ideal for use in nursing homes hospitals and home use. LED and Audible alarm activates when pressure falls below 10mmHg. Easy to replace individual bladders. Cell in a Cell design prevents the mattress from bottoming on the bed in the event of power failure. High volume pump produces 8 liters or air per minute. 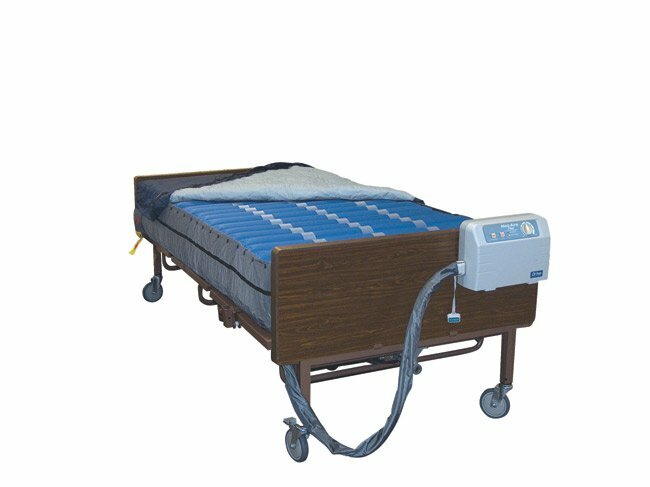 Mattress has 20 air bladders 9 with laser cut low air loss function to increase patient comfort: helps keep the patient cool and speeds recovery. 8 cells are constructed with Nylon/TPU that is soft lightweight and will not stretch. The zippered cover features a TPU material on the outside that is heavy weight and a polyester material on the bottom that is lightweight and durable. The cover is water resistant vapor permeable has a fiber quilted bottom and is machine washable to provide protection and comfort. CPR emergency valve provides fast release of air. Water resistant permeable cover. Warranty: 1 year. 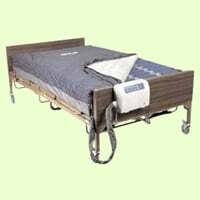 Ideal or use in nursing homes hospitals and home use. LED and Audible alarm activates when pressure falls below 10mmHg. Cell on Cell design prevents the mattress from bottoming on the bed in the event of power failure. High volume extra quiet pump produces 15 liters of air per minute. Mattress has 20 air bladders 9 with laser cut low air loss function to increase patient comfort: helps keep the patient cool and speeds recovery. Low air loss helps keep the patient cool and comfortable increasing healing rates. 10 cells are constructed with Nylon/TPU that is soft lightweight and will not stretch. Quick fill adapter standard. CPR valves for fast (20 second) air release. 750 lb. Weight Capacity. The zippered Nylon/TPU cover material is heavy weight water resistant vapor permeable has a fiber quilted bottom and is machine washable to provide protection and comfort. CPR emergency valve provides fast release of air. Water resistant permeable cover. Warranty: 1 year. Drive is... One of the fastest growing major manufacturers and distributors of durable medical equipment in the home healthcare, medical/surgical and rehabilitation markets in the United States. We have manufacturing and distribution facilities located throughout the United States, as well as in the United Kingdom, Germany, China, Taiwan, Romania and Canada, and market our 2,500 products throughout the world. Our Mission... Is to manufacture and market world class products which focus on innovation, functionality and value to improve the quality of life and to promote independence for the individuals that use our products. This is ideal for use in nursing homes hospitals and home use. LED and audible alarm activates when pressure falls below 10mmHg. Cell on cell design prevents the mattress from bottoming on the bed in the event of power failure. Mattress has 20 air bladders. Its 10 inch cells are constructed with Nylon- TPU that is soft lightweight and will not stretch. 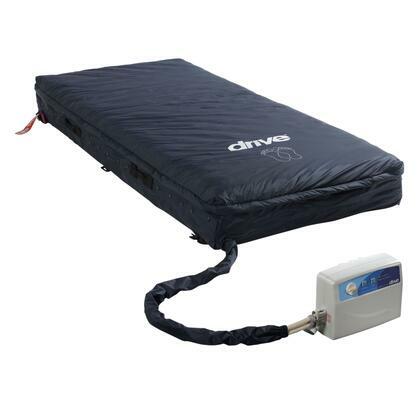 Drive Medical 14029-84 med aire plus low air loss mattress replacement system. 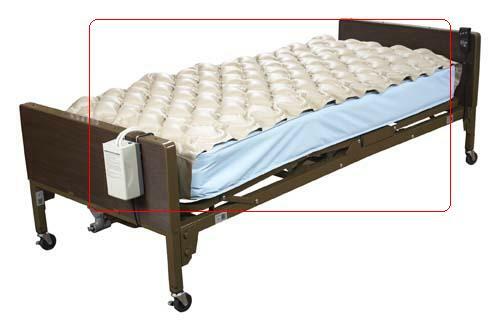 The med aire 8 alternating pressure and low air loss mattress replacement system is indicated for the prevention and treatment of all stages of pressure ulcers. This feature rich group 2 support Surface offers alternating pressure therapy and microclimate control optimizing pressure redistribution and helping to maintain skin integrity. An intuitive 8 LPM (liters per minute) control unit provides 4 cycle time options auto-recovery seat inflation micro processing feedback 3 diagnostic alarms and comfort settings easily adaptable to the patient's specific needs. Designed to administer alternating pressure and low air loss therapy this mattress has head to toe durable air cells with pillow function for comfort cell on cell technology for power outage protection and a low shear anti-friction fluid resistant durable stretch cover. The system provides alternating pressure and is designed to be used in the prevention treatment and management of Pressure Ulcers. The WHISPER QUIET pump produces consistent air flow. Mattress can operate in an alternating or static pressure mode. 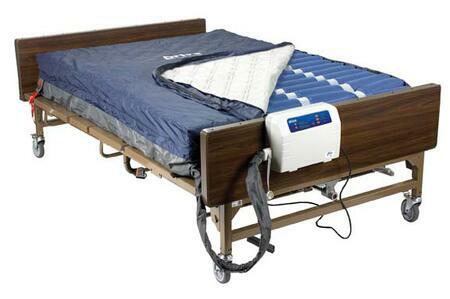 Special vibration isolating features insure that the patient rests easily without feeling the pumps vibrating action. LED and audible alarm provide critical performance data and alert caregiver when pressure falls below 10mmHg inner mattress pressure. Easy to replace individual bladders. Mattress has 20 air bladders 9 with laser holes to achieve low air loss function to increase patient comfort keep the patient cool and speed recovery. Quick fill adapter and carry bag standard. Spring lined air tubes prevent kinks and disruption of air flow. CPR valves provide fast 20 second deflation. 8 Inch high air cells are constructed with Nylon / 50 percent PVC for durability. Designed to prevent treat and manage pressure ulcers in the home or long term care setting. The Med-Aire Essential incorporates a system of (18) 8 in. deep individual bladders to maximize immersion and envelopment. The removable cover is quilted for comfort low shear anti-microbial water-resistant and vapor permeable. Pump Power: 110 VAC \ 60 Hz. Pump Cycle Time: 10 Minutes. Drive is... One of the fastest growing major manufacturers and distributors of durable medical equipment in the home healthcare, medical/surgical and rehabilitation markets in the United States. We have manufacturing and distribution facilities located throughout the United States, as well as in the United Kingdom, Germany, China, Taiwan, Romania and Canada, and market our 2,500 products throughout the world. Our Mission... Is to manufacture and market world class products which focus on innovation, functionality and value to improve the quality of life and to promote independence for the individuals that use our products. Cell-on-Cell design prevents the patient from Bottoming Out in the event of power failure. Whisper quiet pump produces 15-LPM (Liters per Minute) in air flow. 10 cells are constructed with Nylon/TPU that is soft lightweight and will not stretch. The zippered Nylon/TPU cover material is quilted water resistant vapor permeable and machine washable. 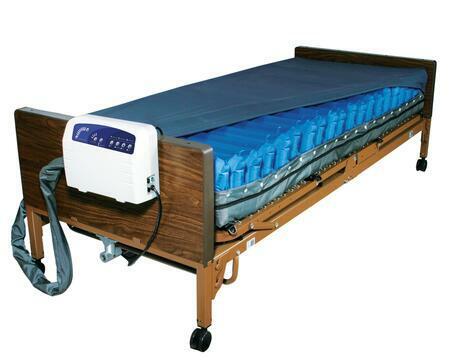 Med-Aire APM/LAL Alternating Pressure Mattress Overlay System with Low Air Loss Dimensions are 36 W x 80 L x 5 H inches The product is designed to be used in the prevention treatment and management of pressure ulcers. 8 LPM Litres per Minute newly designed pump produces consistent air flow. Pump has LED indicators to identify normal and low pressure levels. 17 Air cell configuration 9 with laser holes to achieve low air loss function to increase patient comfort keep the patient cool and speed recovery. 3 Air cells at head section remain static enhancing pillow function. Spring lined air tube prevents kinks and disruption in air flow. 5 Inch cells are constructed from Nylon / 50 percent TPU material that is durable. CPR valves provide fast 20 second deflation. The Nylon / TPU cover material is water resistant vapor permeable and machine washable. The cover is secured to the mattress with straps. 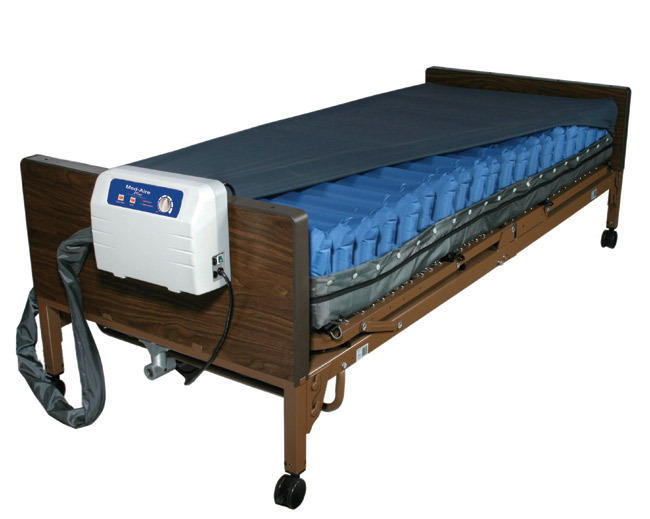 Designed to prevent and treat any stage pressure ulcer this combination therapy mattress system provides alternating pressure and low air loss to optimize pressure redistribution and help protect skin integrity. Easy to set up and use this therapeutic support surface is ideal for homecare or long term care use. .The Med Aire 8" Alternating Pressure and Low Air Loss mattress replacement system is indicated for the prevention and treatment of all stages of pressure ulcers. This feature rich Group 2 Support Surface offers alternating pressure therapy and microclimate control optimizing pressure redistribution and helping to maintain skin integrity. An intuitive 8 LPM (liters per minute) control unit provides 4 cycle time options, auto-recovery, seat inflation, micro processing feedback, 3 diagnostic alarms, and comfort settings easily adaptable to the patient's specific needs. Designed to administer alternating pressure and low air loss therapy, this mattress has head to toe durable air cells with pillow function for comfort, cell on cell technology for power outage protection, and a low shear, anti-friction, fluid resistant durable stretch cover. 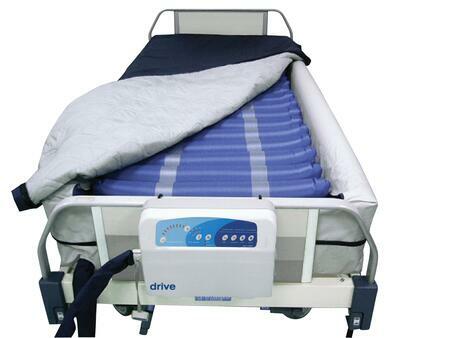 .The Med Aire Bariatric Low Air Loss Mattress Replacement System by Drive Medical is perfect for people looking for alternating pressure for Bariatric people. The alternating pressure system is optimized for pressure redistribution for people with up to Stage IV pressure ulcer, and thus was designed to prevent, treat, and manage pressure ulcers in a home, long term care, or acute care setting. The cell-on-cell design of 10" deep air cells prevents "bottoming out" which is when the patient would sink to the bottom of the mattress. The Med Aire Bariatric Low Air Loss Mattress even provides an additional 24 hours of use in the event of a power outage. The advanced digital pump allows for a custom setting which allows the individual to set the unit to his comfort and safety needs, and will even auto return to a alternating pressure mode if the system is left on static mode for more than 2 hours. The convenient cover stretches 4 ways, is low sheer, fluid resistant, vapor permeable, quilted and zippered. In the unlikely event that one of the 20 air cells malfunctions due to a puncture, they are easily removed and replaced. The unit also has a pillow function allowing 3 air cells at the head of the bed to stay in a static mode for better comfort and easier sleep. The system has 3 distinct diagnostic alarms which tell you whether the problem is with the mattress or the pump allowing for easy and effective troubleshooting. Be sure to consider the Med Aire Bariatric Low Air Loss Mattress Replacement System for effective treatment and ideal comfort. 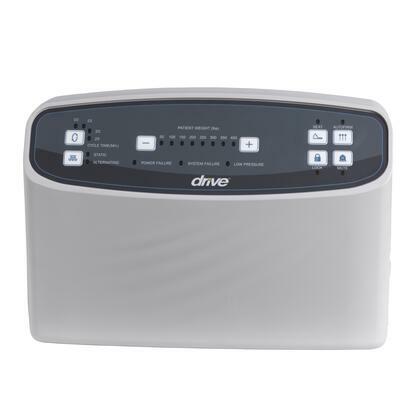 .The Med Aire Bariatric Low Air Loss Mattress Replacement System by Drive Medical is perfect for people looking for alternating pressure for Bariatric people. The alternating pressure system is optimized for pressure redistribution for people with up to Stage IV pressure ulcer, and thus was designed to prevent, treat, and manage pressure ulcers in a home, long term care, or acute care setting. The cell-on-cell design of 10" deep air cells prevents "bottoming out" which is when the patient would sink to the bottom of the mattress. The Med Aire Bariatric Low Air Loss Mattress even provides an additional 24 hours of use in the event of a power outage. The advanced digital pump allows for a custom setting which allows the individual to set the unit to his comfort and safety needs, and will even auto return to a alternating pressure mode if the system is left on static mode for more than 2 hours. The convenient cover stretches 4 ways, is low sheer, fluid resistant, vapor permeable, quilted and zippered. In the unlikely event that one of the 20 air cells malfunction due to a puncture, they are easily removed and replaced. The unit also has a pillow function allowing 3 air cells at the head of the bed to stay in a static mode for better comfort and easier sleep. The system has 3 distinct diagnostic alarms which tell you whether the problem is with the mattress or the pump allowing for easy and effective troubleshooting. Be sure to consider the Med Aire Bariatric Low Air Loss Mattress Replacement System for effective treatment and ideal comfort.